This guide follows the Stuart Highway south from Darwin to Alice Springs. The only towns of significance along the 1500km journey are Katherine and Tennant Creek. Otherwise there is little more than roadhouses every 200km or so. u ² Adelaide River Inn Phone 08 8976 7047. 18 units. Single $45, double $75. Pine Creek was a 1870s gold rush mining town. Some old buildings remain. u u Pine Creek Hotel Motel 40 Moule St. Phone 08 8976 1288. 14 units. Single $63, double $74, triple $80, extra child $10. BBQ. Katherine is on the last permanent river before the desert and is a reasonably bid town for these parts. 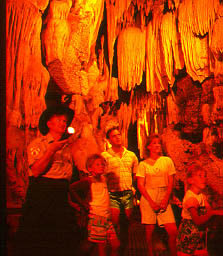 It provides a base for visits to Katherine Gorge and the Cutta Cutta Caves. From Katherine you can also head 612km west to Kununurra in the Kimberleys of Western Australia. Katherine Region Tourist Association is open weekdays 8.45am to 5pm, Saturday 8.45am to 3pm, Sunday 9.30am to 4pm. Phone 08 8972 2650. The Parks & Wildlife Office is on Giles St. Things to see are the Old Train Station, Katherine Museum, School of the Air, Framed Gallery on Katherine Tce. Mimi Arts & Crafts, on Katherine Tce, sells Aboriginal artworks from the surrounding region. The shop is Aboriginal run. Katherine has a Public Swimming Pool. Katherine Low Level Nature Park, 5km from town, is pleasant and shady beside the river with a popular swimming hole. There are also riverside Thermal Pools 3km west of town on the Victoria Hwy. Springvale Homestead 8km southwest of town is an old cattle station. There is a 30 minute tour of the homestead during the day. Three nights a week Jawoyn Aborigines put on a corroboree dance, with demonstration spear throwing, fire making and barbecue dinner all for $30.50. Some organised tours from Katherine include the homestead. 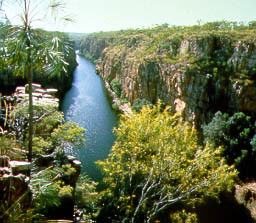 The gorge (pictured) is 30km east of Katherine. It is actually 13 gorges and rapids over 12km of the Katherine River. The area is beautiful and the water level in the river changes to a raging torrent during the Wet season. When the river is not in flood you can swim. Do not mind the fresh water crocodiles too much. 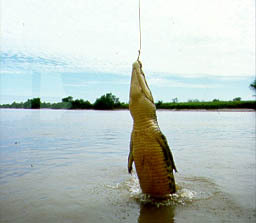 This variety of crocodile, unlike the unlike the salt water variety further north, is too small to eat people, but has been known to attack small children. The park visitor centre (phone 08 8972 1886) also has a souvenir shop and cafe. There are 2 hour cruises on the gorge departing 9am, 11am, 1pm and 3pm. There are also 4 and 8 hour cruises too. High speed jet boat cruises operate during the wet for $32. These are fun to ride and they go really fast! If you prefer to explore the gorge yourself there are canoes for hire. These can be taken overnight but book ahead. Phone 08 8972 1253 or contact Travel North in Katherine. There are also light plane and helicopter joy flights over the gorge. 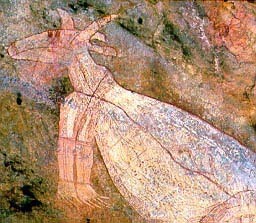 There are Aboriginal paintings in the gorge. A 2 1/2 hour Aboriginal guided bushwalk leaves daily at 1.30pm April to October from the boat ramp. Adults $19, children $10. Book with Travel North in Katherine. Travel North (phone 1800 089 103) has buses to Katherine Gorge six times daily for $15 return. They will do pick-ups from your accommodation. The first bus leaves Katherine at 8am. The last returns from the gorge at 4.15pm. Rare Ghost and Orange Horseshoe bats roost among the stalactites in these limestone caves 24km southeast of Katherine on the Stuart Hwy. Park ranger guided tours are run 6 times daily during the Dry season. $7.50, children $3.75. Phone 08 8972 1940. The rock formations outside the caves are also interesting. Kookaburra Lodge Backpackers Cnr Lindsay and Third Sts. Phone 1800 808 211. In an old motel. Bed $13, twin $40. Kitchen, bike hire. Palm Court Backpackers Cnr Third and Giles Sts. Phone 08 8972 2722. Bed in 8 bed room is $12. Each room has its own bathroom, fridge and TV. Pool, kitchen. Victoria Lodge 21 Victoria Hwy. Phone 08 8972 3464. Dorm $14, double $40. The airport is 8km south of town. Airnorth (phone 08 8971 7277) flies to Darwin ($144) and Alice Springs ($369). All buses stop in Katherine. There are 4 daily to each of Darwin ($42), Alice Springs ($137), Queensland and 2 to Kununurra ($54) in Western Australia. The bus station is opposite the tourist association centre. Some hire car companies have offices in town such as Budget (phone 08 8971 1333), Hertz (1800 089 103) and Territory Rent-a-Car (1800 891 125). Travel North has buses to Katherine Gorge six times daily for $15 return. They will do pick-ups from your accommodation. The first bus leaves Katherine at 8am. The last returns from the gorge at 4.15pm. Phone 1800 089 103. Kookaburra Lodge and Cooper’s Cycles at 3/16 First St (phone 08 8972 1213) have bike hire. Small highway service community and nearby thermal pool. Petrol is available. u ² Old Elsey Roadside Inn Stuart Hwy. Phone 08 8975 4512. 5 rooms. Single $45, double $55, extra child $10. Mataranka Shell Roadhouse Motel Roper Tce. Phone 08 8975 4571. 12 units. Single $53, double $63, extra child $11. Territory Manor Motel Phone 08 8975 4516. 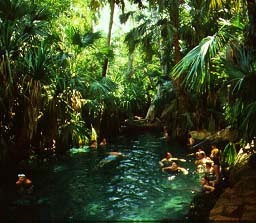 A clear thermal pool in a rainforest oasis is 7km off the highway south of town. Near the pool is the Mataranka Homestead Resort. Phone 08 8975 4544. Dorm $15, air-con motel room $63/$75 for single/double, cabins for two $79, or three $88. Store, bar with snacks, BBQ. Buses travelling along the Stuart Highway stop at Mataranka town centre and the Mataranka Homestead Resort. Small community servicing the highway traffic. Petrol available. Larrimah Wayside Inn Hotel Stuart Hwy. Phone 08 8975 9931. 9 rooms. Single $10 ($20 with air-con), double $20 ($30 with air-con). Laundry, BBQ. From here the Carpentaria Hwy heads 384km west to the barramundi fishing community of Borroloola. Daly Waters Hotel is an old pub 3km off the Stuart Highway and has air-con motel rooms for $45 a single or $55 a double. Petrol. There is a WWII airstrip and restored hangar here. Hi-Way Inn Motel Cnr Stuart and Carpentaria Hwys. Phone 08 8975 9925. 10 units. Single $45, double $55, triple $65. Pool, laundry, BBQ, petrol. Tiny cattle town with highway services. Roadhouse sells petrol. Elliot Hotel Stuart Hwy. Phone 08 8969 2069. 17 air-conditioned rooms. Single $25, double $40, extra child $5. Pool, laundry, BBQ. Tiny cattle town with highway services regarded as being the start of the arid desert country. The northern monsoons do not generally extend this far south. Roadhouse sells petrol. u u Renner Springs Desert Hotel Motel Stuart Hwy. Phone 08 8964 4505. 27 units. Single $50, double $55. BBQ. Highway services at the junction of the Stuart and Barkly Hwys. Roadhouse sells Petrol. The Barkly Hwy heads east to Queensland through Mt Isa to Townsville in on the Great Barrier Reef. The Stuart Hwy runs north to Darwin and south through Alice Springs to Adelaide. Threeways Roadhouse Motel Cnr Stuart and Barkly Hwys. Phone 08 8962 2744. 4 units. Double room $50. Pool, laundry, BBQ. 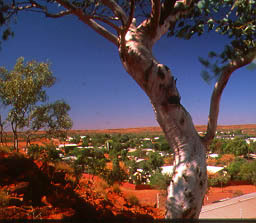 Tennant Creek (pictured) is a mining town in arid lands. Note the red soil of Australia's red centre. Travelling on south you will see a lot more red soil. Battery Hill Regional Information Centre is at the Gold Stamp Battery on Peko Rd. Phone 08 8962 3388. Open weekdays 9am to 5pm, Saturday 10am to 12 noon. National Trust Museum in town has a small building with reconstructed mining scenes. Schmidt St near Windley St. Open 4pm to 6pm May to October. $2. Telegraph Station is in green roofed stone buildings 12km north of town. Dot 6 Mine evening tour is $14. It includes accommodation pick-up, tour of small underground mine, billy tea and fireside talk on the mine’s history. Book at the transit centre or phone 08 8962 2168. 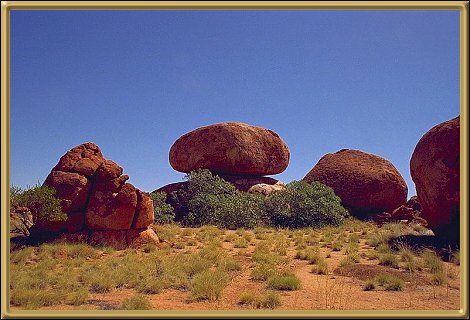 Norms Gold & Scenic Tours have tours of Burnt Shirt Mine ($15) and to the Devils Marbles ($20). Mobile phone 0418 891 711. Safari Lodge Motel has a dorm wing. Davidson St, 400m north of town. Phone 08 8962 2207. Dorm $12. Kitchen, lounge. Tourist Rest Hostel Cnr Leichardt and Windley Sts. Phone 08 8962 2719. Beds in air-con twin room for $14. u u u Bluestone Motor Inn 1 Paterson St, 500m south of town. 65 units. Single $62-$79, double $67-$85, triple $72-$91, extra child $6. Pool, laundry, BBQ. u u ² Eldorado Motor Lodge Paterson St (Stuart Hwy) 1km north of town. Phone 08 8962 2402. 80 units. Single $72, double $78, extra child $5. Pool. u u ² Goldfields Hotel Motel 603 Paterson St (Stuart Hwy) 600m north of town. Phone 08 8962 2030. 30 units. Single $55, double $65, extra child $10. u u ² Safari Lodge Motel Davidson St, 400m north of town. Single $62-$69, double $72-$79, extra child $10. Laundry, spa, BBQ. Desert Sands Serviced Apartments 780 Paterson St. Phone 08 8962 1346. 10 apartments accommodating 3 to 8. Double $55-$62 per night. Pool, spa, BBQ. Buses on the Stuart Hwy stop at Tennant Creek. Services east to Queensland are more regular at Threeways as not all buses detour from the intersection south to Tennant Creek. Giant boulders (pictured) rest precariously on hilltops on either side of the road. Roadhouse servicing the highway. Near the Devils Marbles Conservation Reserve. Petrol available. u ² Wauchope Well Hotel Stuart Hwy. Phone 08 8964 1963. 12 units. Single $25-$55, double $55, extra child $5. Pool, lounge, tennis court, BBQ. Roadhouse servicing the Stuart Hwy. Petrol available. u u Wycliffe Well Motel Stuart Hwy. Phone 08 8964 1966. 5 units. Single $60, double $75, extra child $5. Indoor pool, BBQ, children’s playground. Hotel section has 4 rooms of which 2 are air-conditioned. Single $38, double $48. Tiny cattle town on a rocky escarpment with typical Aussie outback pub. Petrol available. The Telegraph Station is preserved as a memorial to the station master and linesman who were killed in 1874 by a surprise attack by Aborigines. Barrow Creek Hotel Stuart Hwy. Phone 08 8956 9753. 3 rooms. Single $20, double $35, extra child $10. First roadhouse out of Alice Springs. Sells petrol to highway traffic. From Ti Tree roadhouse it is a further 194km south to Alice Springs. From Adelaide River it is a further 113km north to Darwin. From Katherine you can head 612km west to Kununurra in the Kimberleys in Western Australia. From Threeways near Tennant Creek you can head east to Queensland and the Great Barrier Reef at Townsville passing through Mt Isa on the way. From Daly Waters you can head 384km east to the tiny Barramundi fishing town of Borroloola.